Custom index tabs are the perfect finishing touch for your custom binders. Index tabs organize your printed materials so that each category is easily distinguished. With our new in-house digital printing capabilities, now we can offer full color printing on the body of your tabs. 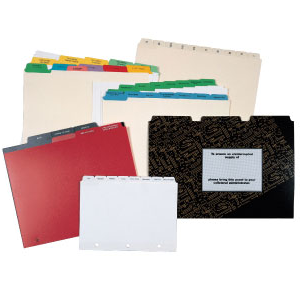 Available with clear or colored mylar on the tabs to create an attractive, durable index set. Having your binders and index tabs manufactured in one plant assures you of a complete package that is delivered on time. 11″ x 8 1/2″, 8 1/2″ x 5 1/2″ or 9 1/2″ x 6″ sheet size, 1/2″ tab extension; clear or colored mylar on tabs; black ink printed two sides (tab only); drilled 3 holes 5/16″ diameter, with reinforcing (optional), collated into sets.